Writing, editing, structuring and monitoring content in WordPress is a tedious task, one that people across many industries share. Whether you're running a blog, website or portfolio, you know formatting can consume your valuable time. Our WordPress Keyboard Shortcuts extension for Google Chrome solves this problem by providing you with an easily accessible map of all the shortcuts you'll need to manage your dashboard. From simply bolding or underlining words, to advanced editing and comment moderation, this tool helps you to make WordPress formatting seamless and easy. New advances in the world of online publishing have led to the creation of user-friendly tools in platforms like WordPress. These tools are incredibly valuable to the content management process, but if users aren't taking advantage of this new technology, what's the purpose? We want to ensure you're getting the most out of your online experience by creating a legend of shortcuts to these important tools. After installation, the WordPress Keyboard Shortcuts extension can be accessed from the top right corner of your Google Chrome browser, with the WordPress logo. Shortcuts are divided into three sections: Visual editor, Advanced, and Comment Moderation. While the most obvious benefit of the WordPress Keyboard Shortcuts extension is convenience, another is the ability to effectively monitor your content. If your blog generates tens or hundreds of comments in a day, filtering these can eat away at your time. With this extension, you'll have a handy map of shortcuts with which you can quickly moderate comments and ultimately encourage engagement on your content. WordPress features you might not have been aware of are now clear with this extension. For example, the "Distraction Free Writing" setting, accessed by selecting Alt + Shift + W, will hide all options in WordPress so you can focus solely on completing your task. Some other useful shortcuts include the "Check Spelling" and "Insert Read More Tag" shortcuts. To use this tool, simply log into your WordPress dashboard and enter the shortcuts using your keyboard. 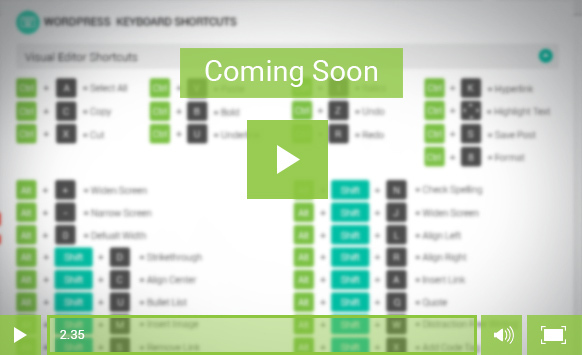 Check out this video tour to learn more about the benefits of our WordPress Keyboard Shortcuts extension for Google Chrome. We explain why we created this extension and how to install it in your browser. Most importantly, you'll learn how to get the most out of this tool in your WordPress account. Our WordPress Keyboard Shortcuts extension for Google Chrome helps you take advantage of the tools and technology offered by this publishing platform, while also saving your time. Take a tour through this extension to see all the visual editor shortcuts, advanced shortcuts, and comment moderation shortcuts that will be available through your browser.